On Tuesday, Governor Laura Kelly vetoed Senate Bill 22, a bill that decouples portions of the Kansas corporate tax code from the federal corporate tax code following passage of the 2017 Federal tax cuts and jobs act. The House amended the bill to include language which reduces the state sales tax on food by 1% (to 5.5%). In order to pay for the sales tax reduction on food, the bill was also amended to require a tax on sales in Kansas conducted over the internet. The House amendments to the bill were intended to give the Governor a reason not to veto the bill, as lowering sales tax on food has broad support. It is argued that this bill would prevent an unintended tax increase on Kansas businesses and individuals. This was the first bill vetoed by Governor Kelly. The House had approved the legislation 76-43, eight votes short of the 84 needed to override a veto. The Senate vote came up three votes short of the 27 needed for a veto override. This week the Kansas Legislature passed and presented to Governor Kelly Substitute for Senate Bill 69, a bill which authorizes a study of retail rates of Kansas electric public utilities. The bill contains compromise language between energy consumers and utilities. This comprehensive rate study bill will help the Legislature determine what steps to take to lower rates. The bill would require the LCC to select an independent organization to evaluate electric utilities and include input from residential, commercial and industrial customers, as well as advanced energy stakeholders. The bill would establish the issues the study must address and would require Kansas electric public utilities to provide relevant information upon request. The intent of the bill is to provide solutions for the Legislature to consider regarding how to lower rates in Kansas, and make Kansas rates more competitive with the region. Governor Kelly has stated that she looks forward to receiving the bill, as this is an important issue to Kansans. Renew Kansas and Kansas Grain and Feed Association had joined a group of industry interests to lobby for the passage of this bill. Next week, the full House may debate House Bill 2340, a bill which would prohibit county treasurers from distributing the portion of property taxes that are in dispute for certain residential and commercial property when the taxes are paid under protest until the appeal process is final. The bill would apply to residential property with amount of property tax exceeding the previous year’s amount by $500, and to commercial property with amount of property tax exceeding the previous year’s amount by $5,000. Proponents of the bill included Representative Dave Baker, Kansas Grain and Feed Association, Kansas Agribusiness Retailers Association, Renew Kansas Biofuels Association, Kansas Soybean Association, and Kansas Chamber of Commerce. The bill was amended with agreed language between proponents and local units of government. The bill was amended to include appeal of the classification of machinery and equipment as a reason to trigger the escrow. The bill is being opposed by county treasurers of certain large counties. Last week, the Senate Commerce Committee, after considering and then setting aside some rather aggressive amendments by the Committee Chair, advanced House Bill 2006 favorably to the full Senate. 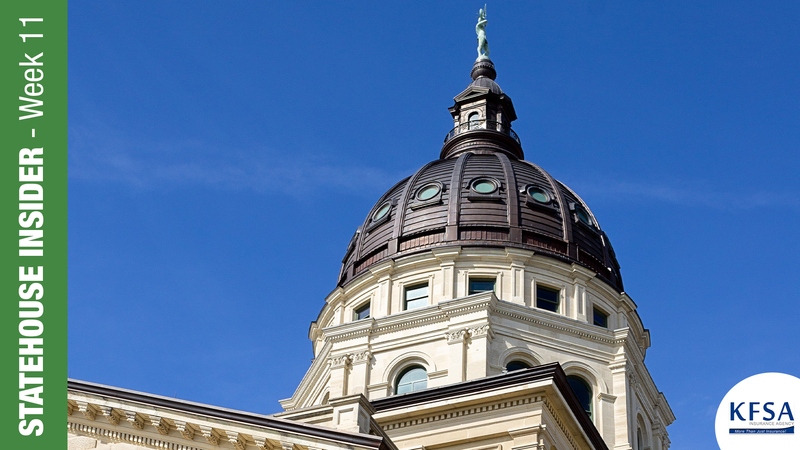 This bill would create a publicly available examination of economic development incentives for Kansas businesses, including tax credits and property tax exemptions of $50,000 or more annually. The bill would authorize the Legislative Post Audit Committee to conduct a systematic and comprehensive review and evaluation of each “economic development program” every three years. Already passed by the House, this bill could be considered by the full Senate next week. On Monday, the House Taxation Committee passed out favorably House Bill 2388, a bill concerning the carry-forward of net operating losses against corporate income tax, and addition and subtraction modifications for property depreciation. This bill would have allowed net operating losses to be carried forward for 20 years, and allowed for a 100 percent deduction of the net loss. Currently Kansas law allows a carry-forward period of 10 years. The bill would also have amended the bonus depreciation guidelines by allowing the taxpayer to elect out of bonus depreciation at the state level, similar to current federal law. The Committee amended the bill to remove all portions of the bill except to allow net operating losses on Kansas businesses to be carried forward for twenty years at 80%. The bill now moves to the full House for consideration. On Wednesday, the full Senate passed on final action House Bill 2178, a bill which would remove any question of intent regarding the phrase “or operates” by striking this phrase from the definition of operator. This modification would make operators responsible under the Kansas Underground Utility Damage Prevention Act only for the underground facilities they own. The bill would add an exemption to the definition of those utilities that provide electric service by noting the demarcation point between facilities owned by an electric utility and its customers can be determined from an operator’s published rules and regulations or service agreements. In addition, the bill would modify existing law concerning the duties of the operator with respect to providing locates to limit the responsibility of electric utilities to only mark facilities they own as long as they publish the utility/customer interface in their service agreements. The limitation in marking responsibility would also minimize the liability the electric utility might incur by providing locates of buried facilities for which they have limited or no construction records to assist them in providing accurate locates. The bill now moves back to the full House for a motion to concur or non-concur with amendments made by the Senate. On Wednesday, the full Senate debated and then passed on final action Senate Bill 219. This bill would amend the scrap metal theft reduction act by creating the scrap metal data repository fund, and authorize the Kansas Bureau of Investigation to administer the program. Committee amendments removed a proposed excise tax and reduced the registration fee on scrap metal dealers to no more than $500. The intent of the proponents of the bill is to fund the program with an $180,000 appropriation from the state general fund. Renew Kansas, Kansas Grain and Feed Association and Kansas Agribusiness Retailers Association had joined a group of interests to lobby for the passage of this bill. The bill now moves to the House for consideration. On Tuesday, the full House passed on final action House Bill 2173, a bill which would establish the procedures to be used by the Kansas Department of Agriculture (KDA), in consultation with the Governor and the Attorney General, in submitting a plan to the U.S. Department of Agriculture under which the KDA would monitor and regulate the commercial production of industrial hemp. The bill would amend existing law to rename the Alternative Crop Research Act the Alternative Crop Act and would add the definitions for “commercial” and “hemp producer” to the Act. Industrial hemp, when cultivated, produced, possessed or used for activities authorized by the Alternative Crop Act would be excluded from the definition of “marijuana” in current law and would be excluded from the list of Schedule I controlled substances. Hemp producers who violate this Act or associated rules and regulations would not be subject to any state or local criminal enforcement action. On Wednesday, the Senate passed a similar bill with Senate Substitute for House Bill 2167. On Tuesday, the full House passed House Bill 2373, creating a transportation planning program (TPP) for the next state highway plan. The bill would direct the Sectary of Transportation to initiate a TPP to plan, develop and operate or coordinate the development and operation of the various modes and systems of transportation in the state. The TPP would provide for the construction, improvement, reconstruction and maintenance of the state highway system. The TPP would provide for the selection of projects, allowing for flexibility to meet emerging and economic needs. TPP expenditures may include, but are not limited to, preservation projects; expansion and economic opportunity projects; or, modernization projects. Sen Sub for House Bill 2007: This bill would authorize the secretary of transportation to designate or construct toll projects; changing toll project financing requirements. The full Senate passed this bill on Tuesday. The House passed a similar bill in House Bill 2369. House Bill 2371: This bill would increase the annual permit for overweight trucks to $300, currently at $150. The bill was amended to set the annual overweight permit at $200 to be consistent with the annual overweight permit for ag products. The full House passed this bill on Wednesday. A similar bill, Senate Substitute for House Bill 2225, passed the full Senate on Wednesday. House Bill 2372: This bill would increase registration fees for electric and hybrid vehicles. The full House passed this bill on Wednesday. A similar bill, Senate Substitute for House Bill 2214, passed the full Senate on Tuesday. House Bill 2354, on Tuesday, the House referred this bill back to committee which would allow student workers in unpaid, school-based vocational training and apprenticeship programs to be covered by the school district’s liability insurance. House Bill 2402: on Wednesday, the House passed this bill which would provide for the corporate practice of medicine by allowing a business entity to employ or contract with an “in-house” physician. The bill now moves to the Senate for consideration. House Resolution 6018: a resolution of the House requesting that the federal government address water issues concerning uranium in the Arkansas River Basin.